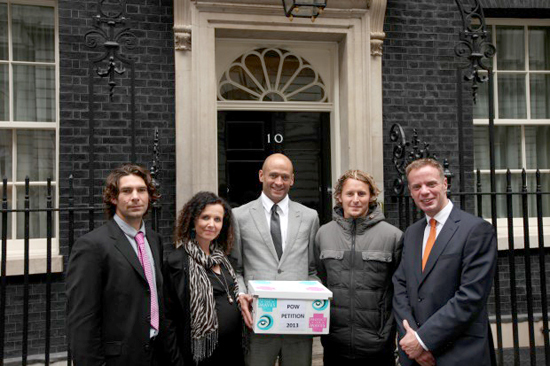 On October 2013, Surfers Against Sewage campaigners were accompanied by double Brit Award winner Ben Howard to deliver the the Protect Our Waves petition to No 10 Downing Street, representing the call of 55,000 surfers for better protection of UK waves, oceans and beaches. SAS also released a new economic survey highlighting the £1.8 Billion value of UK surfing to call for increased action to protect our waves. Ben also attended a briefing event in the House of Commons sponsored by Stephen Gilbert MP, and attended by over 20 MPs, where the new economic study revealed that surfing is worth over £1.8 billion to the UK economy, to reinforce to policy makers and MPs the need to safeguard valuable and vulnerable surfing environments & communities around the UK. The event also included 11 times European longboard champion Ben Skinner, who spoke about the UK’s world class waves. The Protect Our Waves petition received tens of thousands of signatures of support, highlighting the importance of UK surfing resources to coastal communities nationwide. The petition called for better protection for the coastal environment and those that use it. The focus of the petition is a call for amendments to legislation to better control sewage pollution, marine litter and damaging coastal developments & industry. Surfers Against Sewage believes that waves and surf spots deserve to be seen as part of UK heritage and should be afforded greater recognition and protection through debate and legislation. The petition enabled the formation of the Protect Our Waves All Party Parliamentary Group, bringing together more than twenty-five MPs representing the majority of the UK’s key coastal communities, to address the most urgent environmental issues highlighted by the Protect Our Waves petition – marine litter, water quality and coastal development. The Protect Our Waves APPG provides an unprecedented platform for SAS to discuss urgent environmental threats and campaigns directly with politicians and civil servants. We will also be able to hold business and regulators to account, raise questions in the House of Commons, and suggest new and effective measures to better protect the UK’s waves, oceans and beaches. Steve Double MP (Member of Parliament for Newquay & St Austell) is the Chairman of SAS’s Protect Our Waves All Party Parliamentary Group, so leads engagement with MPs, Ministers and the Government in relations to threats to the UK’s surfing habitats and the best ways to protect and promote these increasingly important areas.